Ready to go fishing? Good! Then put away your fishing pole - you won't need it. A bow and arrow? Not bad, but that's not this kind of game. "Fishing with Hand Grenades" is exactly what it sounds like - fishing with hand grenades! It works a bit like Duck Hunt, if you know your NES days! 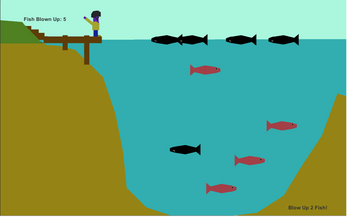 This game plays in rounds, with 5 fish swimming in the lake and 5 hand grenades in your hand. Aim your hand grenade carefully, pull the pin ("prime" it - you'll hear a sound when you do), and when you think you've got the timing just right, throw it! In each round, you must blow up a number of fish (shown in the lower right hand corner) each round to continue on. You can blow up more than the number of necessary fish, and if you blow up all 5 without using all of your hand grenades, you automatically go to the next round. Rounds will get progressively tougher! How many rounds can you go while blowing up every fish? I've set up a small list of achievements for this game. Can you unlock all 5? 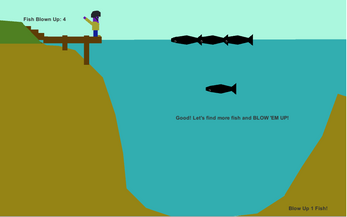 - Catch your fish and cook it at the same time! So convenient! - A nice, relaxing day out at Pumpkin Lake... just you, the sun, the water, and explosives! - No dog to laugh at you if you miss! - The knowledge that other than Duck Hunt, I'm not sure what inspiration I drew upon to come up with this! Can you blow yourself up if you hold the hand grenade too long? You can! The game can end that way. 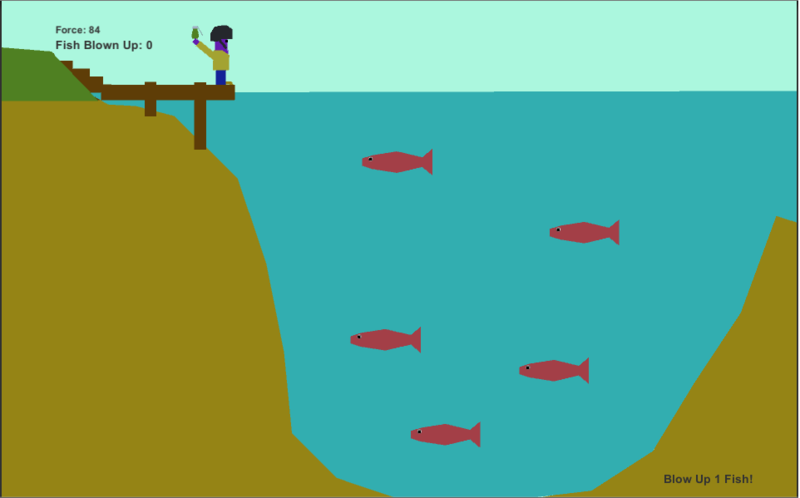 Of course, you have to hold the grenade for a bit if you want to hit that fish near the water's surface. 97 days ago woodsmoke asked this question ,he hasn't been heard from since. Did he pull the pin ?